I agree wholeheartedly. The UD designs from the late 80's and early 90's are dull, dull, dull, and the only good thing about them is that you can find a million of them in good condition. They are still worthless, though. 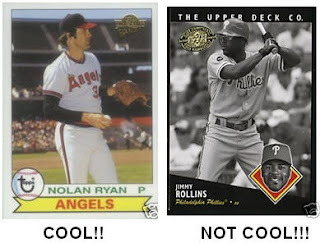 I love the Topps Heritage, and even Bowman Heritage, since they replicate really old designs. Maybe that is why I love A&G and (sorta) Goudey, and why they are so popular.